Some men may feel that buying an electric vehicle will harm their macho image – the powerful thrum and explosions of an internal combustion engine are apparently more manly than the quiet, powerful serenity of an electric engine. That’s more likely to appeal to women. That was a common opinion in the latest poll from Flip the Fleet which asked owners of electric cars to comment on whether men and women are equally likely to switch to an electric vehicle (EV). Slightly more than 60% of respondents agreed that the sexes were equally likely to switch, but they varied widely on why. Another respondent said: “Women tend to be more conscious of conservation and such like. Men tend to be the ones who would still like an E-type.” Women seem to be more engaged in their EV than they are in their ICE car because it reflects a conscious decision to be environmentally friendly. There was also wide disparity on perceptions of how men and women handle the technical side of EVs. A majority felt that generally men are more technically minded and therefore more comfortable with charging the EV and monitoring its battery condition and range. This may be reflected in women being more prone to “range anxiety” – the fear that they will run out of power and be stranded. 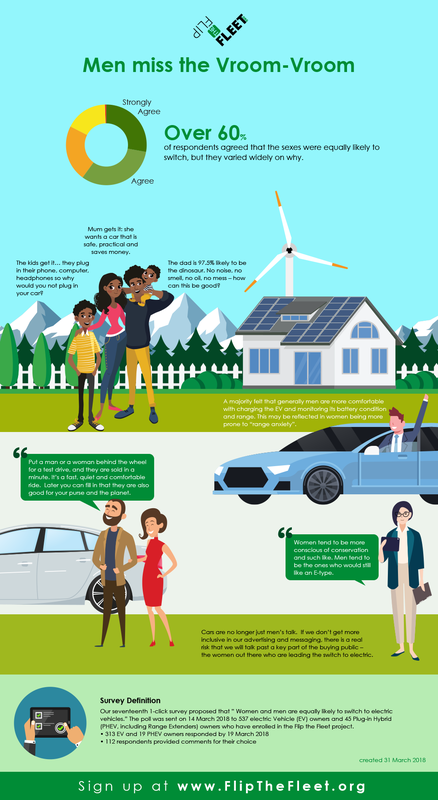 Flip the Fleet’s survey fits with the Energy Efficiency and Conservation Authority’s recent market research which shows that while men are still slightly more likely than women to consider buying a battery EV (31% in October-December 2017), interest from women is growing more quickly, up from 14% in October-December 2016 to 22% a year later. While one EV owner found the survey question to be “the most pointless question ever on Flip the Fleet”, Joe Camuso, a spokesperson for citizen science team that ran the survey, believes that the poll highlighted important strategies for increasing EV uptake in New Zealand. “EV advocacy messages need to be more inclusive of both genders and all motivations for switching to electric. Cars are no longer just men’s talk. But how often do you meet a woman selling cars on a dealers’ forecourt? Nor are EVs just for greenies. If we don’t get more inclusive in our advertising and messaging, there is a real risk that we will talk past a key part of the buying public – the women out there who are increasingly leading the switch to electric” said Mr Camuso. Despite the wide range of opinions about the importance of gender for the pitch, there was widespread consensus on one key strategy. “Put a man or a woman behind the wheel for a test drive, and they are sold in a minute. It’s a fast, quiet and comfortable ride. Later you can fill in that they are also good for your purse and the planet” said Mr Camuso. Flip the Fleet is a citizen science project that provides scientifically reliable information on the benefits and constraints of electric vehicles in New Zealand. The project is partly funded by EECA, The New Zealand Government’s Energy Efficiency and Conservation Authority. Mr Camuso is one of over 700 electric vehicle owners that have signed up to contribute monthly data from their electric vehicles to a communal database. Janie and Joe Camuso have been driving electric vehicles around Whangarei since December 2013. Their Gen 1 Nissan Leaf has clocked up 130,000km, including time as New Zealand’s first electric taxi. The only maintenance and repairs have been replacement windshield wipers and tyres. Janie now drives the Gen 1 as the Camusos have upgraded the taxi with the 30 kW version of the Nissan Leaf. Janie loves the car, she says, particularly because she doesn’t have to visit petrol stations, which can be messy, smelly and inconvenient. She is a school teacher and most of the parents and kids have had rides or borrowed the car to have a go. Joe typically rides his bicycle to work, so Janie has first right of refusal for use of the family EV. On weekends they enjoy emission-free weekend chores and visiting friends.